There was a time when we only did this on Saturday nights. But then Jon & I decided that it was so enjoyable and one night was not enough. So we added Friday nights if we didn’t have anything going on with our friends – and there was much rejoicing. After all, two is always better than one. After a long week of work and working out it’s nice to celebrate the beginning of the weekend with really good music, wine, food, and a beautiful view (in my case, that means looking at my husband). 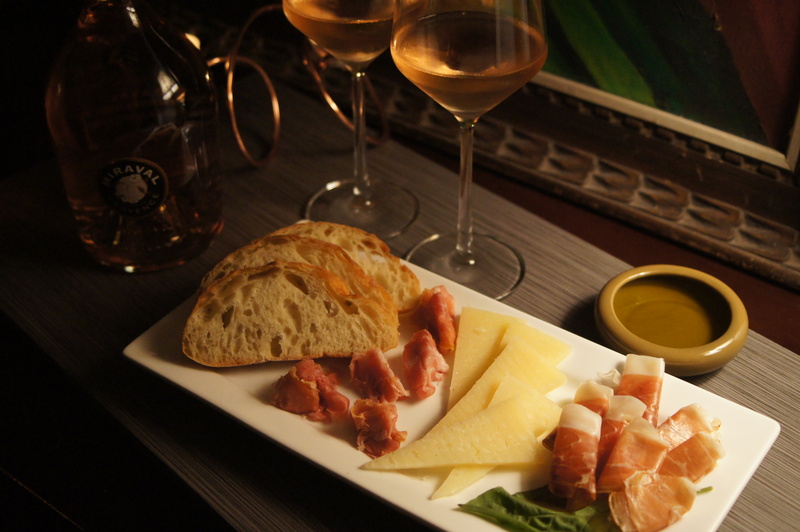 Our wine nights usually consist of an extremely relaxing evening in front of the fire with bottles of rosé and small bites of prosciutto, cheese, bread, with a really good olive oil for dipping. It’s low maintenance, healthy, and easy to put together, yet it feels so indulgent. For the beginning of the night our two sons usually hang out with us. We chat for a bit, play a couple of card games or board games, and I try to get everyone to love Sam Smith as much as I do. Never works. A couple of weeks ago we played The Game of Life and it was funny that my youngest son, Will, who is 11, kept landing on the “add a child” spot. He was having so many children stacked in his car (which he declared was a Tesla) that I nicknamed him Brad & Angelina (you’ll appreciate this tie-in to the Jolie-Pitts further down). Aside from the wine, we get everything else we need from a local store called Brother’s Marketplace – one-stop shopping for good quality food. Their prosciutto and Speck Alto, which is a dry-cured, slightly smoked ham made in Northern Italy, is always so melt-in-your-mouth delicious. There’s a variety of cheeses and the cheese mongers I’ve talked with there are always very helpful and know their cheese. One helped me pick out a 12-month Manchego and suggested a fig jam to go with it. Seriously, when I tried it I thought I was going to pass out from how good the combination was. Jon & I love wine, especially white wine. We want so much to like red, but we both like to drink things that are cold and we just love the taste of white. Unless it’s sangria it’s hard to embrace the red. We actually had a bottle of red during one of our wine nights, but we barely finished the bottle. We decided to try rosé, which is kind of like a white with a splash of red, right? We had our first sip and we immediately turned to the pink side. Shortly after this, we tried Miraval, which is the rosé from Brad Pitt and Angelina Jolie’s vineyard. Oh. My. God. Like Brad & Angelina, we were in love. I wanted so hard not to like it. Maybe because after all these years I’m still Team Jennifer. I know, I should get over it. But how could anyone not like Angelina? She saves the world and makes incredible rosé. The pictures here are what we typically have for wine nights. 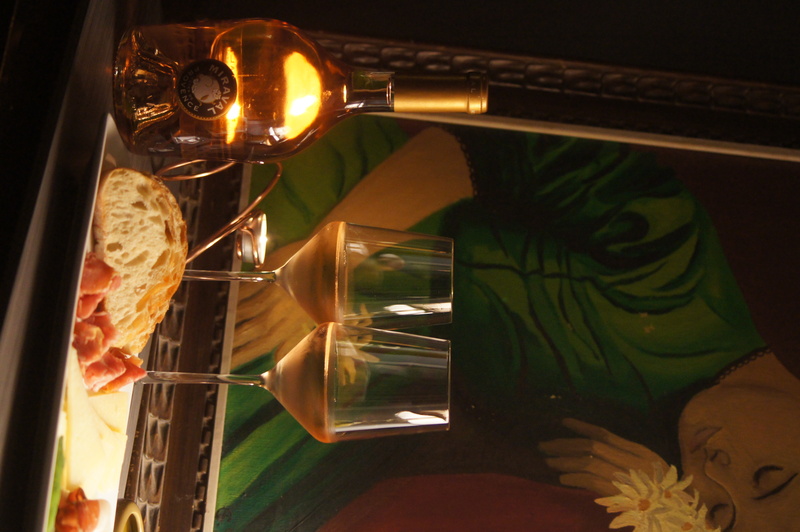 But in the upcoming weeks we plan on trying new rosés and different types of small plates. I would love to try making tapas, specifically ham & cheese croquettes. Manchego cheese cut into wedges. You can sprinkle (or pour depending on how much you like) olive oil over the meats and mozzarella and then add a bit of salt & pepper.